1 How does your family plan vacations? You probably pack clothes, plan menus, and look at maps. Your parents also plan the budget for the trip. A budget is a plan for spending money. One part of their budget can vary greatly: the price of gas. The price of gas affects everyone's travel plans. 2 It would be hard to go on a vacation without using gas-powered transportation. Gasoline is one of many products produced by the process of refining petroleum or crude oil. Gasoline is a volatile liquid made up of different compounds called hydrocarbons. Hydrocarbons have hydrogen and carbon in them. Gasoline is flammable, which means that it burns easily. 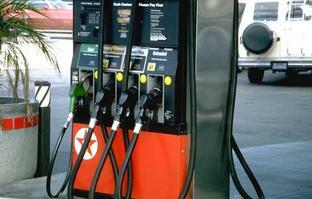 3 Many factors affect the retail price of gasoline. The retail price of gas is the price that people pay at the pump. The price of crude oil per barrel and the cost of refining it are both factors in gas prices. Gas comes from oil refineries. It travels through pipes and is distributed by trucks to gas stations all over the country. This distribution cost affects gas prices, too. Federal, state, and local taxes also add to the retail price of gasoline. 1. The next time you drive around town, make a note of the price of gasoline at three different gas stations. Were the prices the same? Talk to your family about how to conserve gasoline, and write up a list of your ideas. Do you think that your family is already implementing measures to drive less? Why, or why not? 2. Design and draw a new kind of transportation that does not use gasoline. Be sure to name your new vehicle!